These printable 3D minecraft swords are great for the kids and really fuel their imagination with pretend play. 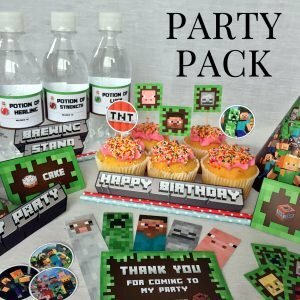 They are also fantastic for decorating your minecraft themed party tables or gifting to your party guests! You can even pin them up on the wall to decorate the room decor. 1x PDF of sword template. This is not a physical item. This is a high resolution digital file in JPEG and/or PDF format (300 dpi). These Life Size Minecraft Swords are best to be printed and glued onto cardboard so they are a bit more heavy duty. These are spread across multiple pages to make them as big as possible. All you have to do is print them out, cut them down and glue onto cardboard or heavy card stock. The swords once made are approx 44cm length by 22cm width.